One sometimes wonders how art exists at all. Artists who intentionally display their work often open themselves to intense criticism. This was never so apparent to me as when I attended the Southern California Xena Fest IV. One of the artworks on display provoked such a lively response in my friends, who went with me, that it provided about thirty minutes of conversation on our drive home from the Fest. What generated all the hoopla? It was a portrait of Xena with concentric circles radiating outward from her left eye done in hot colors. The picture was about 3 feet by 4 feet composed of hundreds of beads. The picture was "framed" with tiny Xena statues on the top and sides (the bottom rested on the easel). The statues were about four inches tall. As we left Yankee Doodles, the scene of the Fest, the conversation started almost immediately. 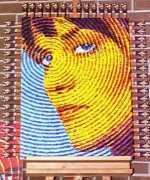 Friend one began, "And did you see the picture of Xena made of beads? Oooh, I didn't like it." Friend two responded, "I know what you mean. Did you see all the little Xenas? It was just too much!" Friend one turning to me, "Greg, what did you think?" I said, "I think that given the context, the genre, the particular style of art, and the presentation of the subject, it was perfectly fine." Friend one, "Well, I still think it was tacky." I said, "How did you come to that conclusion?" Friend one replied, "I know what I like, and I didn't like it." Friend two cutting in, "In other words, it was an emotional response." I rebutted, "I gather that. But didn't you apply any other criteria?" Friend two rather smugly, "I just didn't like it. Isn't that enough?" "But what about the time and effort put into the work, the man, er, person hours involved? I mean I saw one of the waitresses examine it then go get another waitresses in order to show it to her. They oo-ed and ah-ed over the detail for several minutes," I protested. Friend one replied, "Yes, yes. I know all about it. But it's the emotional response that drives my opinion more than anything. I mean if I was at a garage sale, and they paid me to take it, I still wouldn't." "And where would you put it if you bought it?" asked Friend two. "It doesn't go with anything." "That may be," I said, "But let's break it into individual components and see if that helps us to understand it." As the conversation went on I suggested that subject, color, and pattern would provide viable patterns for analysis. Easy, enough: Xena. What was she doing in the art work? Since the piece existed only as a static medium and since only Xena's face was shown in slight profile, what was the artist trying to convey? It struck me that the artist was trying to express Xena's ability to "focus". Why focus? Focus is one of the "meta-themes" running through Xena . For example in THE QUILL IS MIGHTIER... (56/310), Gabrielle tells Ares that Xena taught her to focus. Ares in turn tells Gabrielle that he gave Xena that ability to focus. In THE GREATER GOOD (21/121), after learning that Xena was dead, Gabrielle took out her frustrations on a tree. As her rage fades and she slumps down against it she faintly says, "Focus, I've got to focus." Ares chides Xena in THE DELIVERER (50/304), "Why do you always focus on the effect and not the goal?" Maybe the artwork is highly effective because it places a viewer under the scrutiny of Xena, and being her focus of the moment is highly disturbing. Color helps set the tone of a piece art. Different colors evoke different emotional responses: blue for sadness, red for danger, and black for depression. In Bead Xena, Xena's face was done in yellow, perhaps denoting caution or a warning to, "Be nice." Different cultures have assigned different values for color. Black is the color used in Western funerals. White is the color used in the East. This was one of the things Xena was alluding to when she told Gabrielle in THE DEBT I (52/306) that everything was different in Ch'in. One of the things that humans do really well, something that is only now making its way into military robots, is pattern recognition. So what do the concentric rings represent? The rings reminded me of the following: a diffraction grating, wavelets rippling outward from some disturbance in a pool of water, or the distance measurement rings on a radar scope. Diffraction gratings are used to change the quality of light as it emerges from a source before it reaches its recipient. If you have a kitchen with fluorescent lighting, there is probably a diffraction grating between you and the fluorescent lights. The grating softens the fluorescent light. On the other hand, lighthouses use Fresnel lenses to concentrate light. In this particular art piece, the diffraction grating has a concentric pattern, a pattern sometimes used on the warning lights of detour traffic signs. The light inside the lens is white, but, thanks to the red diffraction grating, we perceive the light as red. If that is the case, is Xena emitting light or some other quality? And as that light or quality passes through the diffraction grating is it changed? Or is the audience emitting the light and it is falling on Xena? And out of what medium is the diffraction grating constructed? If Xena is emitting something, the emotion of Xena giving the "look" for example, and as the emotion passes though the diffraction grating becoming yellow, does it caution us of something? Is emotion being 'colorized'? Does the grating then color our perspective? If we are emitting emotion and it is changed to yellow light falling on Xena, are we trying to warn her of something? Is it implied that we are separated from Xena by the diffraction grating? The grating could be a boundary between fantasy and reality. Does grating then color our perspective? Could the grating represent time, the difference between our reality and the reality of the "Xena Scrolls" with the scrolls functioning as the diffraction grating? Diffraction gratings themselves may be art, stained glass windows for example. The window, the diffraction grating is the subject. The sun, symbolizing God, shines though. A picture or image is created which conveys a message. We interpret individually, or a priest, reverend, or pastor interprets (another diffraction grating) for us if we are not familiar with the iconography represented. Of course the scary question is, "What does God perceive on the other side when he looks at us?" At the end DREAMWORKER (03/103), Xena has a philosophical discussion with Gabrielle on blood innocence. Xena uses the analogy of a rock dropped into a pool of water to represent the deed of murder. Xena cautioned Gabrielle that the deed would ripple across one's life changing everything. That was made horrendously clear in THE DELIVERER (50/304) when Gabrielle crossed the line and killed Meridian. Does Bead Xena then place the viewer below the surface of the water looking up at Xena? What is causing the disturbance? Has a tear fallen from Xena's eye into the pool below? I am not crazy about this explanation. The color of Xena's face is wrong. Yellow is a hot color. It does not work in this context. I would have perhaps expected Xena's face to be blue for sadness, perhaps crying for Marcus. Fighter pilots speak of something called situational awareness, the ability to take in dangerous situations at a glance. We might then infer from the piece that Xena has turned on her radar and gone into situational awareness mode. Xena is focusing on something. She has that "look". Gabrielle and Ares discussed Xena and her "look" in THE QUILL IS MIGHTIER... (56/310). The concentric rings radiate outward from Xena's eye, as if she is scanning the area around her. I even suppose you could view Xena's face as a land form and her eye as the emitting point of the radar sweep. The color works here too. Radar scopes seem to emit a similar range of color. Woe to anyone who winds up as a blip on Xena's radar, and they had better hope that they are near the outer ring and moving off the scope. Of course a more benign meaning could exist. Petrocles, Borias, Marcus, Hercules, Gabrielle, and now Rafe may all exist or have existed as blips on Xena's "love radar". The piece, composed of hundreds of beads, presented a seamless whole when viewed from a distance. Close up individual beads could be seen. If a radar scope or Xena emitting radar is being modeled, then the beads could represent the individual pixels creating an image on a radar scope. OK, OK, I have may have over analyzed the piece a bit and perhaps sound a bit like the poor poetry book author, Pritchard, in the movie Dead Poets Society (Peter Weir, 1989). Heaven forbid some of you may even be ripping out the electronic pages of Whoosh . However, I would like you to try this on for size, a passage from N Is For Noose by Sue Grafton. Kinsey Millhone, a private investigator, the focus of N Is For Noose , hears this response from sheriff's detective Rafer LaMott, describing another character in the book, "The woman comes equipped with emotional radar, forever scanning her environment, trying to pick up matters of no concern to her." Since the other pieces at the festival shown by the artist did not necessarily incorporate concentric circles and used other geometric shapes, I suspect that diffraction gratings would be the most likely theme being used by the artist. If true, I think that this works well because the viewer must become actively involved in each piece. He or she must determine how the diffraction grating is altering the meaning of the subject. Does it intensify the subject, change the subject's meaning, or shift its focus? Does it reveal a depth to the subject not readily apparent at surface level? Is it some kind of boundary separating us from the subject? If art's primary purpose is to evoke emotional responses in its beholders rather than simply expressing an artist's viewpoint, then the work in question was a huge success. The name of the piece was "Bead Xena" (Maybe "Xena Draws a Bead" might be more appropriate). The artist's handle was "Artboy", and he was also responsible for designing the t-shirts for the Fest. What kills me the most though is my friends, who were so critical of the "Bead Xena," liked the t-shirts. I'm an English teacher at Canyon Springs High School in Moreno Valley, California. I usually teach general English survey classes like English I, English II, and English III. Every once in a while I get to teach Science Fiction/Fantasy or Detective/Gothic Fiction. I've sponsored the role-playing club for eleven years and the Japanese animation club for two years. I'm currently collecting robots representative of screen and television either in model or toy format. Sometime in the future I'll post pictures of them to the web. If anyone knows where I can get a Johnny Five, please let me know. Bret Rudnick and I went to Pacific High School in San Bernardino, CA at the same time but never met. It was bizarre but fun bumping into him on-line over Xena and WHOOSH. Favorite episode: REMEMBER NOTHING (26/202). Xena emerges from her vision with a strong feeling of who she is and what she must do. Favorite line: Xena to Diana in WARRIOR...PRINCESS (15/115): "Well, you're going to have to convince people you're me, and I like dark." First episode seen: I saw was SINS OF THE PAST (01/101). I popped in at the "fight on heads" scene and found my "focus." Least favorite episode: SACRIFICE II bums me out because Callisto is gone. Of course Strife came back in HTLJ: Yes Virginia There Is A Hercules so maybe there is "hope."